PARIS, Nov 21, 2010 / FW/ — Romanian fashion label Party Noire released its 2010 ready-to-wear collection “Minimal” in Bucharest this week targeted for the modern woman who does not wait for special occasion s to look and be her best. Designed by Romanian designer Alina Cosma, who is also the founder of Party Noire, “Minimal” is the third collection of the fledging label which was launched on May 2008. Inspired by the 1950s and the elegance that dominated that era, Minimal proposes silk blends, cotton, viscose and light wool. 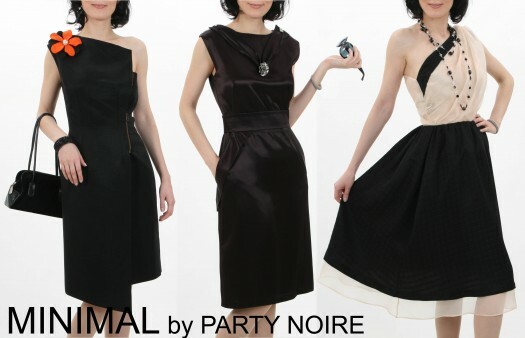 Priced from 250 Euro to 370 Euro, the dresses will be made-to-order and made-to-measure as PARTY NOIRE continues its online retail experience. “My design for this collection is based on the combination of very traditional and very modern. I wanted to keep things simple yet to avoid having an outdated result,” said Alina Cosma. Feminine and figure flattering silhouettes benefit from trendy design elements like metallic embellishments, deconstruction and asymmetry, colour contrast used in both an obvious and in a discreet way, all of which are fused to generate an overall impact of long-gone elegance with a modern twist sums up the idea behind Minimal. “I wanted it not only to look beautiful, but to also feel beautiful. Given the minimal details of design I believe that each of these dresses can easily translate into individual, timeless, and gorgeous new additions,” added Cosma.